No, I am not pregnant! But someone is expecting! 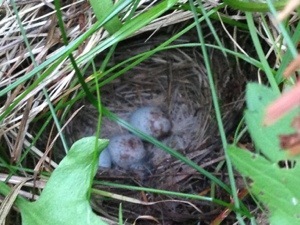 Recently, as a gas fitter was replacing a part on our pool furnace, he discovered a nest of tiny little eggs in the bushes behind the pool shed. Way down into the bushes, into the dried grass and weeds a momma bird had hollowed out a place where she could see the sun, and anything else that might peer into her nest, but deep enough that it would be out of the line of sight of any going by. ere was this tiny, very verbal, bird that kept yapping, flitting back and forth. He had the presence of mind to realize that the behaviors exhibited by this bird were protective, and that there might be a nest somewhere, so he started to look around, and eventually discovered what this mamma was protecting. Into that hollowed out nest were five of the tiniest eggs possible. Mamma bird is starting to get accustomed to my intrusions … although I am not getting accustomed to her greeting. About every second day I crawl up onto the upper part of our back yard, perched precariously on my knees, then try to spy the spot where the nest is located. Each time I ‘get’ to experience deeper understanding of the element of surprise, when mamma bird comes flying out at my face, squawking to scare me away from the family she is protecting. I have tried to assure her that her family is safe in my eyes, and that my hands will never touch her precious treasures, but I do not seem to be as good at communicating my intentions as she is at communicating hers. As a mom, I have to say that swallow or sparrow mamma really could have chosen a better, more safe place to lay her eggs. If my beast was ever off leash, she could get her nose into that nest in no time, as could any other four-legged creature … and there are many of the feline variety who walk through our garden. There is so much possibility of harm that could come to she and her babes. As there is to each of us. We often live a little on the edge, with potential dangers all around. But we have One who loves and protects us, because He made us. He formed the birds of the air, and cares for them … He formed man and woman, and He cares for us too. We are His, and He sees we humans as his ‘pièce de résistance’. He gives us the promise that He will never leave us (Hebrews 13:5), that He cares for us (1 Peter 5:7), that He has loved us with an everlasting love (Jeremiah 31:3), and that we are more valuable than many … sparrows.